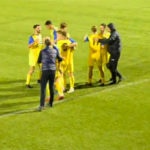 BSC Glasgow went in as the favourites after their 3-0 win at Kelty Hearts last weekend; however, no-one would have guessed it would be so easy, especially in the arctic conditions that battered the Indodrill during the 90 minutes. Manager Stephen Swift was delighted with his charges after beating Lowland League form side Kelty Hearts at New Central Park on Saturday. With this fixture described as a potential banana skin for Stephen Swift’s side, the manager would have been delighted to see the boys put in a stellar performance to brush the University side away. Despite Forfar dominating large swathes of the game, BSC Glasgow held the League One side until the 75th minute in our first ever Scottish Cup Third Round match. Declan Hughes scored in the last ten minutes as BSC Glasgow leapfrogged their visitors in the Lowland League table. 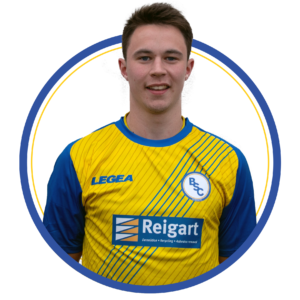 The only change from the BSC squad who thumped Vale of Leithen 4-0 a fortnight ago was Joe Irvine coming in to replace the injured Robbie Duncan on the wing. The opening fifteen minutes showcased a few attempts from both sides including a Bonnyrigg header from Keiran McGachie header that was just over the bar, as well as another McGachie chance that was halted in its tracks thanks to a brilliant tackle from skipper Ross Smith proving our back line could be just as menacing as their attack. However, there was only so much our defence could do as Rose grabbed two goals in three minutes. 20 minutes in, a bit of mix up between John Mitchell and Ross Sinclair, allowed McGachie, who is in tremendous form at the moment, to capitalise on the error and tap it into the net. The second goal came from the head of Dean Hoskins who managed to just get the ball over the head of Sinclair. Not long after, Ross Smith put himself in the referee’s book after bringing down McGachie outside the box. Luckily, the free kick couldn’t be converted. BSC attempted a counter attack which built up to a Martin Grehan effort that almost powered past Michael Andrews. The rebound fell to Jamie Mills; but he couldn’t connect at the right point. The only other attempt from the home side came from a trademark Hughes free kick which went inches over the crossbar. Usually, BSC would be the ones to come flying out the gate, however, Bonnyrigg seemed to be the experts and dominated the first twenty minutes. To combat this, Tom Orr came on to replace Davie Winters. 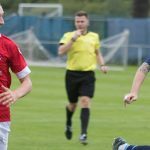 If anyone looked to be the man to spark a BSC comeback, it was The Flash – Jamie Mills – as he made it look easy to get past his men on the wing and into the box, however there was no yellow shirt on the receiving end. Minutes later, you would’ve sworn Bonnyrigg had guaranteed it when Jonny Stewart’s strike went post to post, sliding across the line on the way. Another BSC man got a booking in Tom Orr who went into a harsh challenge with Dean Brett and it was a challenge that had the traveling Rose support shouting for a red. With only eight minutes remaining, BSC grabbed a consolation goal through Declan Hughes who made the most of a brilliant pass from Jamie Mills who connected sweetly with a low shot that slid under Andrews. 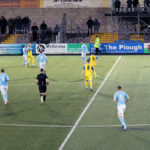 Unfortunately, the goal never frightened the away team in any form as only two minutes later, they secured their victory when Ewan Moyes found the back of the net from close range. 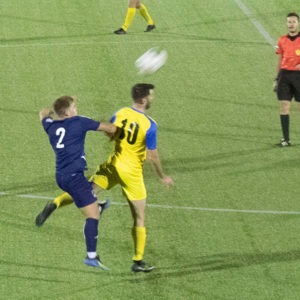 BSC Glasgow dominated mid-table Vale on Friday night to move up the Lowland League table, putting four goals past them in the process. 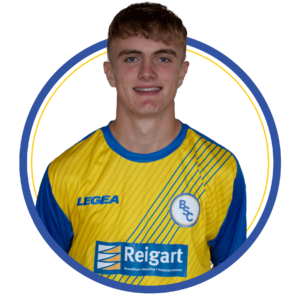 The only change from the team who beat Cumbernauld Colts in the Scottish Cup, was the return of St Johnstone loanee Ross Sinclair between the sticks replacing Stephen Barr. Martin Grehan wins a header against Vale right back Ryan Currie. 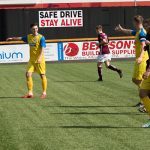 BSC kicked things off with a goal six minutes in – a great long ball from the skipper, Ross Smith, floated over the Vale defence and landed at the feet of Declan Hughes who knocked a beautiful lob over Ross Gilpin. The first 20 minutes were full of chances that could have made the score line even greater. Declan Hughes attempted a few decent crosses to no avail and Davie Winters shot just wide of the post after being marked out by the Vale defence. Just before the half hour mark, Martin Grehan slotted one under Gilpin to find the back of the net with a nice little assist from Winters. Vale were unfortunately forced to make two substitutions just after the second goal as Ross Gilpin went down and David Bonnar went off with a bad limp. BSC wish them the best and hope it’s not too serious as we know all about how hard injuries can be on a side at this point in the season. Just before the half-time whistle, Grehan found himself through following immense pass from Hughes, however, Vale managed to clear the ball off the line just in time. It didn’t matter as seconds later, a powerful shot from Cammy Ballantyne bounced of Vale skipper, Jack Blaikie for an own goal. 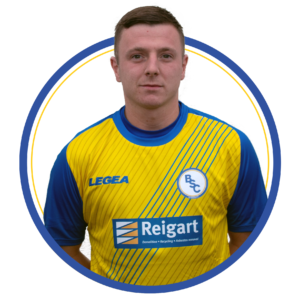 Vale’s biggest chance came not long after the break when the league’s top goal scorer, Sean Stewart fought past the BSC back line and came one on one with Ross Sinclair who rushed outside the box and made a fantastic tackle the game at 3-0. Davie Winters nearly got his name on the scoresheet when Ballantyne played a great pass, allowing Winters to go for a power shot just outside the box but Beveridge made a decent save. Martin Grehan came off at the hour mark for Ryan McStay. Winters couldn’t capitalise on another chance when Beveridge denied him once again just before Carlo Pignatiello and Robbie Duncan came off from Joe Irvine and Spencer Brown. The second half remained slow until the 88th minute when Dec Hughes grabbed his second of the game from a perfect pass from Winters to slide the ball just under Beveridge to really hammer in the victory. 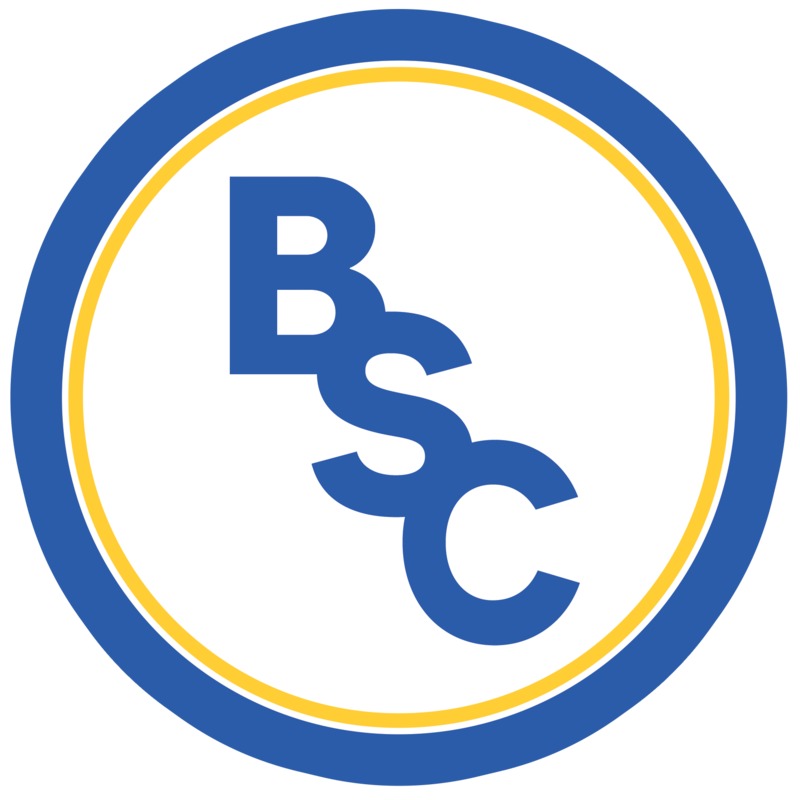 BSC Glasgow left Broadwood in good spirits after dominating an in-form Cumbernauld Colts to make it through to the Third Round of the Scottish Cup for the first time in their history. There were minor changes to the squad that smashed seven past Threave Rovers last weekend; Jamie Mills returned to fire up and down the wing, replacing Joe Irvine and Carlo Pignatiello slotted back into midfield in place of Spencer Brown. The game got off to a decent start for BSC who dominated the first five minutes. Ross Smith and John Mitchell avoided early conversations with the official when both seemingly went for the same tackle on Sean Brown which could’ve been nasty if their timing had been worse. Robbie Duncan began what was to be a great game for him, with a shot from just outside the box which unfortunately went straight into the gloves of Jordan Pettigrew. Within the first twenty minutes, it was apparent that the referee didn’t have much interest in playing the advantage rule. Although he did give a free kick after Jeff Fergus put in an awful challenge on Declan Hughes, who couldn’t manage to curl the kick over the wall. Hitting the half hour mark, the travelling band of BSC fans started to feel nervy as Colts began to break through the defence and reach the box. Luckily for BSC though Jamie Mills, The Flash, won every challenge and one-on-one that came his way. Half time was fast approaching when the Cumbernauld faithful screamed Broadwood down with a handball appeal when it appeared to bounce off Hughes’ arm in the box. Two minutes before the whistle, Colts’ Jordan Marshall smacked the crossbar from 40 yards out. BSC Glasgow, however put any worry in that small section to bed when Martin Grehan got the ball down in the box to Hughes who went for tap in then immediately capitalised on Pettigrew’s loose catch by getting a toe to it at the last second. Both teams came flying out the gate determined to secure the coveted spot in the Third Round, although it was Colts who grabbed the first chance. A perfect corner flew into the box following a great angled header towards goal and Stephen Barr made one of the saves of the tournament so far, showcasing his reflexes to claw it away from point blank range. The counterattack was immediate – a cross from David Verlaque landed at the feet of Davie Winters who went for a straight shot which Pettigrew palmed away, only into the path of Carlo Pignatiello who smashed it so hard into the net, even an attempted block on the line proved futile. The Broadwood fans were in uproar an hour in when a hard tackle from John Mitchell only received a booking. The official balanced things out for both sets of fans a few minutes later when Grehan went down in the box under a push from Scott Davidson. Grehan received a talking to from the official for having the temerity to get fouled. Jangling nerves in the BSC support seemed justified five minutes later as Colts pulled one back following a great cross that found Fraser Team in the middle. So far so similar to our first match of the season at the Indodrill a couple of weeks ago. The manager brought off Winters and then Martin Grehan with Tom Orr and Ryan McStay taking their places. Stephen Barr continued his fantastic afternoon with a few great punches from impressive crosses, that coupled with a Verlaque block and clearance kept BSC ahead. In the 82nd minute, ecstasy struck. Carlo ran into the box and slipped a ball through to Robbie Duncan who capitalised on a mix up between Colts keeper and defence and tapped it into the net at the back post. To settle one of the best afternoons in the club’s history, Carlo went for another shot in the 85th minute which was palmed away by Pettigrew into the path of the onrushing Tom Orr to tap in the rebound and secure BSC Glasgow’s place in the Third Round of the William Hill Scottish Cup. BSC Glasgow ruled over the 90 minutes at The Indodrill with a perfect 7-1 victory over Threave Rovers. BSC Glasgow went ahead twice at The Indodrill, however, Colts came back in the last ten minutes with stunning equaliser, making it difficult to be too annoyed at the result.